HORSELL - SWINDON, THIS IS SWINDON. This Ginger Beer bottle is in the Swindon Museum archive and dates to 1890's. 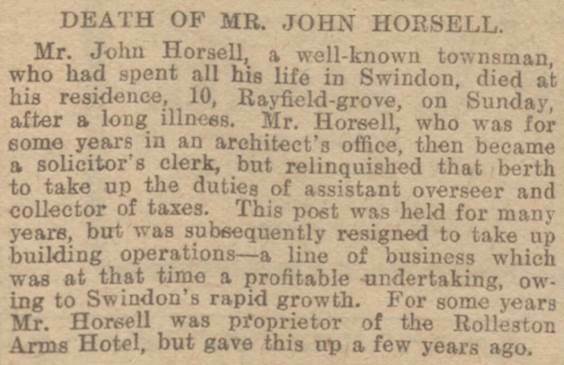 ﻿John Horsell was the landlord of the Rolleston Arms Hotel on Commercial Road in Swindon during the 1890's. He was the Overseer of the New Swindon Local Board (local council) and had a street (Horsell Street) named after him. He was also the Deputy Captain of the old Swindon Fire brigade. In 1901 his first born son, Albert John Horsell, was the landlord of the RIFLEMAN'S ARMS in Regent Street, Swindon. John Horsell died in 1907 aged 59. Horsell Street was demolished in the 1960's to make way for Swindon College. In 2014 Swindon College was demolished to make way for a Morrisons Supermarket.